(Sedona, Ariz.) – An uncommon map of Colonial-era New England by Dutch cartographers Hugo and Carolus Allard sold for $12,320 in an online auction held Jan. 26 – Feb. 21 by Old World Auctions (OldWorldAuctions.com). A preview of the sale was held at the Miami International Map Fair in Florida, where the maps could be appreciated by collectors gathered for this important event. Prices quoted include a 12% buyer’s premium. 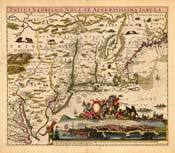 The New England map by Allard was the sale’s top lot. Executed around 1680, the scarce map commemorated the Dutch recapture of New Amsterdam (New York) in August 1673 with a large inset (known as the “Restitutio View”). In it, Manhattan is depicted as seen directly from the east, with the Dutch army marching along the quay and a cannon firing from the fort. It provides one of the earliest depictions of the wall that was later named for Wall Street, with its guardhouse and gate. The map attracted several serious bidders, finally going to a Dutch collector who took his prize home to Amsterdam. An important map of Southeast Asia by another Dutch cartographer, Jan Huygen van Linschoten, realized $10,640. The map, dated 1595, is the first published map of the Far East derived from Portuguese sources. Thus, it is credited with breaking the Portuguese monopoly on the East Indian Trade and was an important source of information on Southeast Asia in the early 17th century. Material pertaining to Britain did very well, as was evidenced by the high number of bidders from the United Kingdom. Two handsome, bird’s-eye views of London exceeded estimates in the category. One was a superior example created in 1572 by Braun & Hogenberg, in original color. It made $7,280. Also, Matthias Merian’s 1652 panorama of London, fetched $2,464. Another important map of Britain was John Speed’s vibrant depiction of the Saxon kingdoms, often referred to as the “Speed Heptarchy.” This famous map, created in 1676, found a new owner for $6,160. Were you aware that Benjamin Franklin almost had a state named after him? It’s true. In 1784, settlers in present-day western North Carolina and eastern Tennessee organized a state government and petitioned Congress for admission to the Union. But due to fascinating political intrigue, Congress turned down their appeal. Still, the state maintained a legislature and governor until 1788. The fledgling state appeared on only a small number of maps into the early part of the 19th century, including a rare example created in 1804 by Christian Gottlieb Theophil Reichard, which sold for $2,016. Many excellent 19th century maps soared past estimates, firmly establishing a market that had been previously passed over by collectors for being “too new.” An 1870 folding map of Illinois by George Cram left the auctioneer’s estimate of $180 – $220 in the dust when it reached $2,240. An 1883 folding railroad map from Rand McNally, titled “Iron Mountain Route to Arkansas, Texas and California,” brought $476; and a scarce ephemeral railroad map from 1878 illustrating the route from Kansas City to Denver, along with several connecting routes, saw strong bidding at $896. Old World Auctions’ next online sale (Auction # 119) is slated for April 20 – May 9. Featured items will include a 1528 edition of “The Dream of Scipio” by Ambrosius Macrobius; a beautiful Ortelius map of Africa from 1570; a miniature Ortelius Epitome atlas, published in 1602 by Jean Baptiste Vrients, with original color; Thomas Jeffery’s important map of Louisiana and Florida from the American Atlas; and Nicholas Sanson’s influential “Le Nouveau Mexique, et la Floride,” which presents a huge (and fictitious) island of California. As a specialty auction company, Old World Auctions is well regarded for its research and scholarship. Each lot is fully and accurately described, including academic references. Each map is scanned in full color at a very high resolution, using state-of-the-art technology. These high-resolution images are zoomable, allowing bidders to see remarkable detail. Old World Auctions holds five sales throughout the year, always as online affairs – there is no on-site auction house (although phone and absentee bids are accepted). To cut down on last-minute bidding wars, or dubious at-the-wire bid submissions common to many auction sites, Old World Auctions created a “ten-minute rule.” See the website for details: OldWorldAuctions.com. To learn more about Old World Auctions, you may visit them online. To consign a historical map or an entire collection, you may call them at (928) 282-3944. The e-mail address is info@OldWorldAuctions.com.